1. Put all the ingredients other than the rocket and balsamic vinegar, into a bowl. Season and mix until thoroughly coated. 2. Preheat the grill to high. Thread the fish onto the soaked skewers, alternating with the preserved lemon, onion and courgette. 3. Grill the skewers for 8 minutes, turning once, until the fish is thoroughly cooked through. 4. 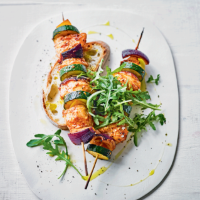 Toss the rocket with a little drizzle of olive oil and the balsamic vinegar, and serve immediately with the kebabs. Delicious with crusty bread.